We covered implicit differentiation recently, and I'm relatively clear on it, but I'd like to clarify a few things. I'll first explain the example and then explain my questions. (b) Find an equation of the tangent line to the circle x^2 +y^2 = 25 at the point (3, 4). (a) Questions: I'm not quite clear on why the derivative of y^2 = 2y * y' rather than simply 2y. I understand that it's because y is a function of x, but don't understand why multiplying by y' is the solution. Also, I don't quite understand why, when they solved the equation 2x+2yy' = 0 for y', they said that y' = -(x/y). I'm much more lost on this aspect of part (a). Is it simply always this way? (b) Questions: The only thing I'm unclear with for part (b) is why y' (-3/4) is used as the slope of the tangent line as opposed to x'. Thank you very much, this forum is a great resource! Questions: I'm not quite clear on why the derivative of y^2 = 2y * y' rather than simply 2y. I understand that it's because y is a function of x, but don't understand why multiplying by y' is the solution. ... is the chain rule. 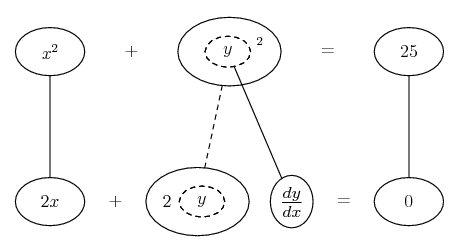 Straight continuous lines differentiate downwards (integrate up) with respect to x, and the straight dashed line similarly but with respect to the dashed balloon expression (which is the inner function of the composite, which needs the chain rule). Also, I don't quite understand why, when they solved the equation 2x+2yy' = 0 for y', they said that y' = -(x/y). Just algebra... if I've read your question right. Subtract 2yy' from each side and cancel. The only thing I'm unclear with for part (b) is why y' (-3/4) is used as the slope of the tangent line as opposed to x'. y' means dy/dx which is the rate of change of y with respect to x, which is the slope. Draw balloons with LaTeX: Balloon Calculus Drawing with LaTeX and Asymptote! first the derivative itself is a linear operator so when you use "implicit differentiation" you always wind up with a linear equation for y'. All they did was solve for y' algebraically. From 2x+ 2yy', subtract 2x from both sides: 2yy'= -2x. Now divide by 2x: y'= (-2x)/(2y)= -x/y because the "2"s cancel. Because they are writing the tangent line in the form y= mx+ b and, in this form, the slope is y'. The linear equation [m,ath]y(x)= mx^1+ b[/tex] (I wrote the power "1" to make this point) has derivative [/tex]y'= m(1x^0)= m[/tex]. The line through $\displaystyle (x_0, y_0)$ with slope m has equation [/tex]y= m(x- x_0)+ y_0[/tex]. With $\displaystyle x_0= 3$, $\displaystyle y_0= 4$, and m= -3/4, that is y= (-3/4)(x- 3)+ 4= (-3/4)x+ (9/4)+ 4= (-3/4)x+ 25/4. If you don't like fractions, you can multiply through by 4 to get 4y= -3x+ 25 or 3x+ 4y= 25. Yes, it would be possible to write a line as x= my+ b and, in that case, m= x'. If you really want to do that, go back to the original equation, $\displaystyle x^2+ y^2= 25$ and, thinking of x as a function of y, differentiate with respect to y: 2x (dx/dy)+ 2y= 0 so 2x(dx/dy)= -2y and dx/dy= -2y/2x= -y/x. At (3, 4) x'= dx/dy= -4/3. Now write the equation as $\displaystyle x= m(y- y_0)+ x_0$ with $\displaystyle x_0= 3$, $\displaystyle y_0= 4$ and m= x'= -4/3. That gives x= (-4/3)(y-4)+ 3= (-4/3)x+ (16/3)+ 3= (-4/3)y+ 25/3. Multiplying through by 3 gives 3x= -4y+ 25 or 3x+ 4y= 25, the same equation and same line as before. Although there is no "mathematical" difference it is convention to write y as a function of x rather than x as a function of y so we are all using the same notation. Just making sure I'm applying the chain rule correctly.